On April 10, 2019, in a 232-to-190 vote divided along party lines, the House of Representatives voted to approve the Save the Internet Act (HR 1644). In doing so, Democrats made good on a promise that became a rallying cry in many progressive circles during the 2018 election: restore net neutrality. 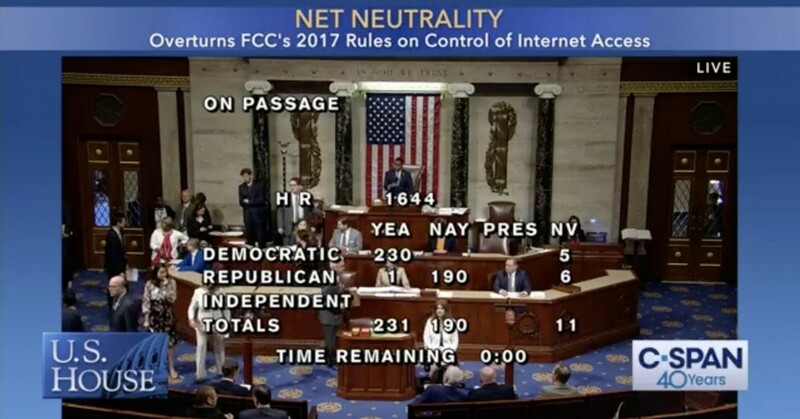 For the first time ever, net neutrality legislation has cleared the House of Representatives. The Save the Internet Act would repeal the Federal Communications Commission's Restoring Internet Freedom Order adopted in 2017 (although the order did not go into effect until 2018). An amendment sponsored by Rep David Trone (D-MD) that finds that annual FCC reports on the state of broadband deployment are important to fostering further deployment and that Congress relies on the accuracy of these reports. “The parties’ competing visions — and seemingly widening political divide — played out as debate began on the House floor,” wrote Tony Romm and Brain Fung. “What my friend calls a takeover of the internet, we call protecting consumers,” countered Chairman Doyle. The partisan division echoed outside the halls of Congress. I’m glad the House passed the Save the Internet Act today. It protects net neutrality by restoring enforceable rules and reinstating the FCC as the cop on the beat responsible for protecting consumers. The FCC was established to promote and police the communications networks of this country. Broadband is the communications network of our present and future. The endurance of the open internet cannot be left to chance or the whims of massive profit-maximizing corporations. This administration’s hasty, careless abandonment of the carefully crafted, common sense 2015 Open Internet framework was ill-considered and flat out wrong. Along the way, the Commission ignored the will of millions of people and proved itself to be out of touch with regular folks across the country, regardless of their politics, who rely on unfettered internet access as a precondition to participation in our society, economy, and democracy. The division was also echoed by industry and consumer advocacy groups. “Today’s House vote was a disappointing wrong turn that will only lead to a dead end,” said NCTA - The Internet & Television association which lobbies on behalf of large cable companies. “Consumers should be frustrated that House Democratic leadership has chosen to pursue a partisan path which will ultimately fail to deliver the net neutrality protections that every stakeholder agrees is important. Despite this setback, our industry remains committed to working on a bipartisan solution and hopes that the end of this political exercise will clear the way for more thoughtful and sincere efforts to protect consumers without outdated and burdensome overregulation." The bill may face a challenge getting Senate approval. Majority Leader Mitch McConnell (R-KY) said the bill is "dead on arrival in the Senate." And, there's always the threat of a Presidential veto -- a threat that got real this week. On April 8, the White House's Office of Management and Budget advised President Donald Trump to veto the legislation. To justify the veto, the statement painted a picture of surging broadband investment and robust new networks, free to flourish now that Title II was out of the way. But Karl Bode was among those who called out OMB's "fuzzy math." "Unfortunately for the White House, there’s no evidence to suggest any of those improvements had anything to do with killing net neutrality," he wrote. "Some of the data points aren’t accurate, and others are the result of policies from past administrations." Despite the tough political road ahead for the bill in the Senate and from the White House, ensuring net neutrality is wildly popular with the public and across Democrats, Republicans, and Independents. If you recall, when the Senate previously considered a Congressional Review Act resolution to repeal the FCC’s 2017 order, the measure passed 52-47. For now, we can appreciate that a net neutrality bill, for the first time, passed through the House of Representatives. Where it goes from here remains to be seen. You can follow along with the on-going net neutrality saga by subscribing to Headlines.